There’s something about rustic furniture that brings a “down-home” country charm to any residence, even if it’s located in the heart of a bustling city! Our extensive collection of Rustic Dining Room pieces allows you to add a touch of rural magic to your home. Choose from dozens of beautiful dining room furnishings of all types such as the Farmhouse Sideboard, Fireside Chair/w Caning, Algonquin Chair and Rustic Dining Pine Bench. 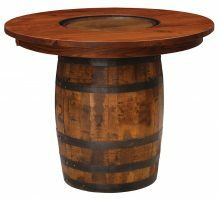 We make all of our rustic pieces from only the finest, most durable materials. Many pieces offer a choice of northern kiln-dried hardwoods such as oak, cherry, maple and hickory. Other pieces are manufactured from pine, rustic pine or cedar. 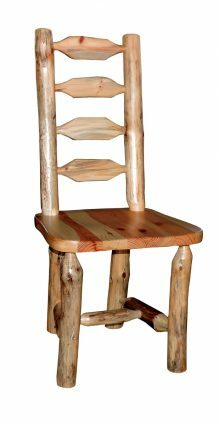 Highly skilled Amish master crafters use your choice of wood and other custom options to create a beautiful rustic furniture piece that is sure to be the highlight of your dining room. 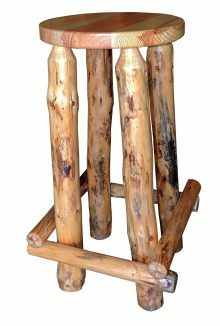 You know you want a rustic set of furniture for your dining room. You can imagine hosting parties with a new sideboard and table and a whole bunch of chairs, but you aren’t sure which ones to choose. 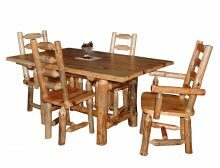 We offer such a large selection of Amish rustic dining room furniture that some people see multiple sets they’d like to buy. They have a hard time narrowing their choice to just one. Did you just move into a new house? Then you may want to get multiple new pieces. You don’t need to worry about matching the décor that’s already in the room, so you can feel free to choose whatever you want, even if it’s a little more country than the furniture you’ve picked out for other rooms. Perhaps you have an aging dining room table that could lose a leg any day now. You favor classic design in the dining room but hope to add a kick of new style with a rustic replacement. 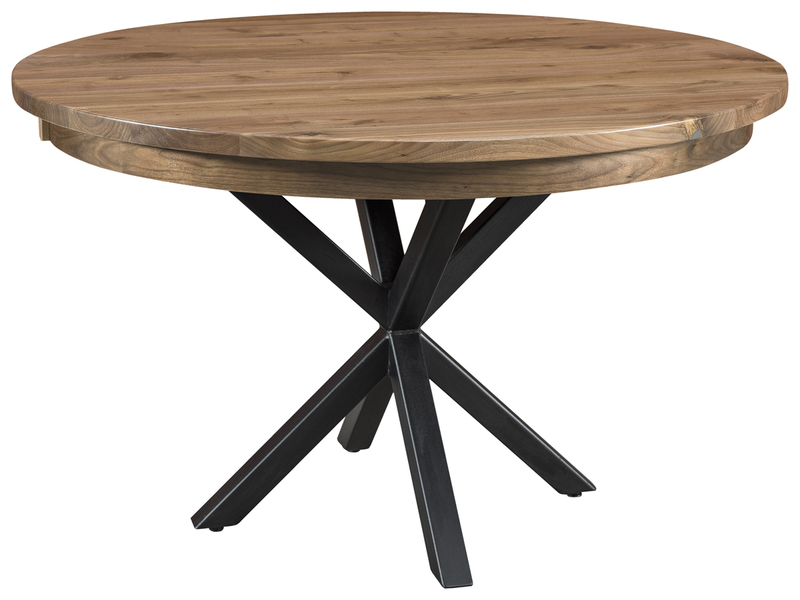 Try a table that has classic lines, such as the 48″ x 72″ Live Edge Top Kalispel Table in Rustic Cherry or our 44″ x 72″ Beam Table in Ruffsawn. They’ll jibe with what’s already in your dining room while also contributing a bit more edge. Or perhaps you just want a new accessory to add visual interest to your dining room. Consider replacing your chairs with benches or buying a small jelly cupboard. These small additions will give your space more style and help you figure out the room’s true identity. The easiest way to achieve a uniform look in your dining room is replacing most of the furniture. Investing in a set instead of one or two new pieces offers greater long-term return. You won’t have to worry about getting new furniture that matches the old every few years, as different pieces wear out. And you will want to host lots of dinner parties to show off your new look! We make high-quality, durable furniture that stands up to daily use. You can feel confident that our furniture will remain with you for years to come. But you also need to take care of it properly to ensure that longevity. Always use specially made wood cleaners to polish your wood furniture. Don’t ever use water. Avoid placing the new furniture near vents or baseboard units, which can dry out wooden dining sets. If you think that gorgeous rustic dining room furniture is out of your price range, you’re in for a pleasant surprise! 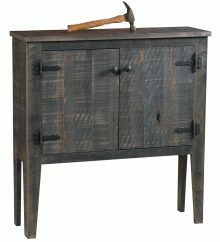 With our wide assortment of money-saving discounts, we make rustic furniture affordable for even the tightest household budgets. Purchase any piece from our collection today and get up to 33% off the regular retail price! You can also take advantage of our large-order discount, which makes for an extremely economical way to purchase multiple pieces. You’ll even get an additional 3% off just for paying by check. 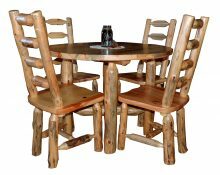 Browse our entire collection of solid wood Rustic Dining Room Furniture right now!